In Isaac Asimov’s I, Robot, a collection of nine short stories about robotics, Asimov explores the possibilities of human-computer interaction. How can humans and computers co-exist? How can they work together to make a better world? A research group from the Meertens Instituut in Amsterdam and the Antwerp Centre for Digital Humanities and Literary Criticism recently introduced a new digital creative writing system. Using a graphical interface, an author drafts a text sentence by sentence. Then, the system proposes its own sentences to continue the story. The human and the computer work together to create what the system’s developers call “synthetic literature”. Create a stimulating environment that fosters co-creation: ideally, the machine should output valuable suggestions, to which the author retains a significant stake within the creative process. To learn language and sentence structure, the system has been trained using the texts of 10,000 Dutch-language e-books. Additionally, the system was trained to mimic the literary styles of such renowned authors as Asimov and Dutch science fiction author Ronald Giphart by generating sentences that use similar words, phrases, and sentence structures as these authors. 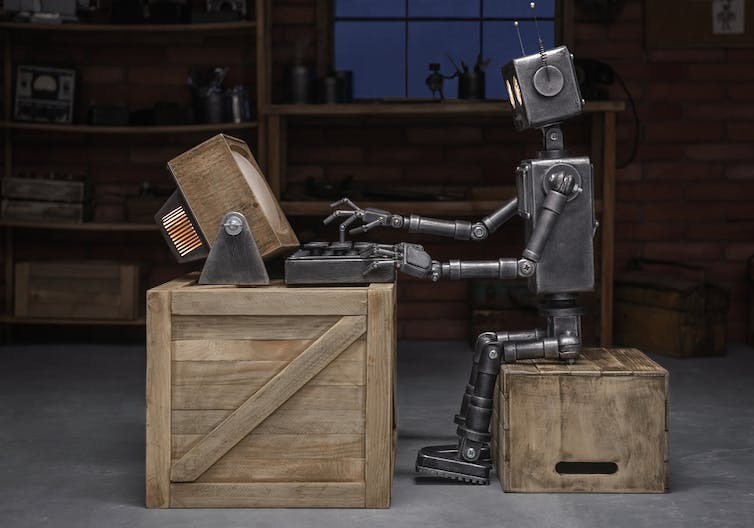 As part of this year’s annual Nederland Leest (The Netherlands Reads) festival, Giphart has been trialling the co-creative writing system to write a tenth I, Robot story. Once Giphart’s story is completed it will be published at the end of a new Dutch edition of Asimov’s classic text. Throughout November, participating libraries throughout the Netherlands will be offering free copies of this edition to visitors to get people thinking about this year’s festival theme: Nederland Leest de Toekomst (The Netherlands Reads the Future). As Giphart types new sentences into the system’s graphical interface, the system responds by generating a selection of sentences that could be used to continue the story. Giphart can select any of these sentences, or ignore the system’s recommendations altogether. The point of the system, its developers explain, is to “provoke the human writer in the process of writing”. Giphart says he still considers himself “the boss, but [the system] does the work”. One article even described the system as being ideal “for those who have literary aspirations, but who lack talent”. Can a computer be creative? The “synthetic literature” referred to by this system’s developers implies a combined production effort of both human and computer. Of course, the human still guides production. As co-developer Folgert Karsdorp explained: “You have numerous buttons to make your own mix. If you want to mix Giphart and Asimov, you can do that too.” The system follows its user’s direction, responding by using its own capacity for creativity. But can a computer ever be truly creative? This is a question that the field of computational creativity has been studying since computers were invented. The field generally accepts that a computer can be called creative if its output would be considered creative had it been produced by a human. It is the computer artist [the developer] who decides what input a system will respond to, how the system will respond, how unpredictable the system’s output will be, and how transparent the system’s functionality will be to users. Even the most unpredictable output, according to Boden, results from choices the computer artist has made. While a developer may not be able to predict a system’s exact output, the output nevertheless reflects the choices the developer has made while programming. Computer systems can be trained to mimic the language and sentence structure of particular writers. The co-creative writing system Giphart is using isn’t able to produce an entire book by itself, but it can produce paragraphs that continue Giphart’s story for him. Giphart, though, ultimately has the power to choose what computer output he uses. But does this mean that Giphart alone will be credited as the author of his Ik, robot story, or will his computer be given credit as a co-author? It’s still unclear. Although it could be hotly debated whether the creative writing system is just a tool for Giphart’s vision or could be considered an agent itself, we won’t be seeing the demise of human authors any time soon. One Nederland Leest blog post compares this new method of writing to the evolution of the electric guitar. It may have existed for nearly a century, but it wasn’t until Jimi Hendrix showed us how to really play the instrument that its potential was realised. Similarly, we still need to discover how to “play” this writing system to get the best results, whatever they might be. 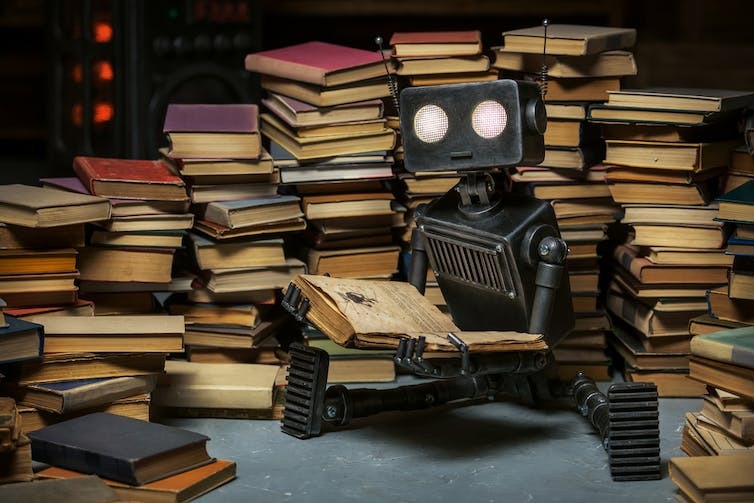 So is synthetic literature the future? Maybe. Keep reading to find out. A video explaining the project is available here, in Dutch.